In this study, a novel subset of doublecortin-like kinase 1 (DCLK1)-immunoreactive (IR) tuft cells that also contain serotonin (5-hydroxytryptamine, 5HT) is described, in terms of their number, regional distribution, possible synthesis or reuptake of 5HT and proximity to 5-HT-containing enterochromaffin (EC) cells. The small intestine from C57BL/6J mice was divided into five segments while the large intestine was kept undivided. Double immunostaining was used to estimate numbers and topographic distribution of 5HT-IR (DCLK1/5HT) tuft cells and their possible expression of tryptophan hydroxylase (TPH) and serotonin transporter (SERT). Also, possible contacts between tuft cells and 5HT-IR EC cells were studied. In the small intestine, up to 80% of all tuft cells were identified as DCLK1/5HT-IR; in the large intestine, such cells were rare. 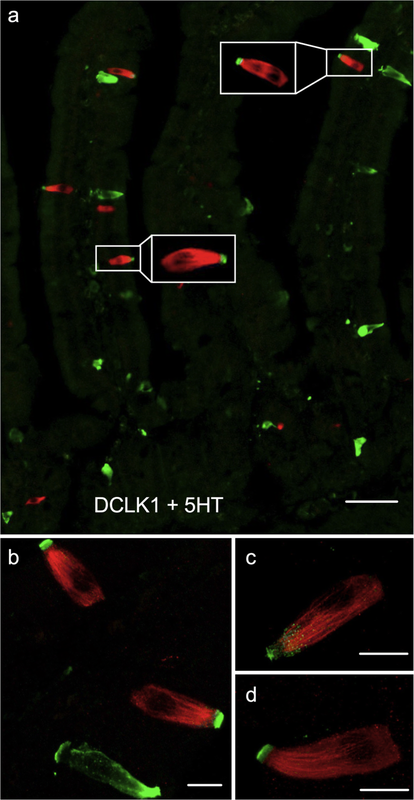 The highest number of DCLK1/5HT-IR cells was found in the upper small intestine. The numbers of DCLK1/5HT-IR cells gradually decreased distally. DCLK1-IR tuft cells were not found to contain TPH, the rate-limiting enzyme in 5HT synthesis. SERT, the selective transporter for 5HT reuptake, could not convincingly be demonstrated in tuft cells. In villi and crypts, 3% and 10%, respectively, of all DCLK1-IR cells were in close proximity to EC cells. EC cells in close proximity to DCLK1-IR cells were, in villi and crypts, 3 and 8%, respectively. We conclude that DCLK1/5HT-IR cells constitute a novel subset of tuft cells that may have unique roles in the GI tract. Intestinal tuft cells are located within the mucosal epithelium and identified by their unique fusiform shape and apical microvilli extending into the lumen (Jarvi and Keyrilainen 1956; Sato 2007; Gerbe et al. 2012). In the gastrointestinal (GI) tract, tuft cells are found scattered in the mucosa and show a proximo-distal gradient in number from the jejunum to colon (Cheng et al. 2018). They contain an intracellular tubular network spanning between microvilli and endoplasmic reticulum, enabling molecular exchange between the lumen and the cell (Hoover et al. 2017). Tuft cells likely also cross talk with adjacent cells through lateral projections reaching into the nuclei of neighbouring cells (Hoover et al. 2017). GI tuft cells are considered chemosensory, acting as an interface between lumen, neurons and endocrine cells (Howitt et al. 2016; Kaji and Kaunitz 2017). A proportion of tuft cells are found in close proximity with satiety-associated endocrine cells expressing cholecystokinin, peptide YY and glucagon-like peptide 1 (Cheng et al. 2018). In addition, close contacts between nerve fibres, particularly calcitonin gene-related peptide (CGRP)-containing ones and tuft cells are described (Morroni et al. 2007; Bezençon et al. 2008; Cheng et al. 2018). In the GI tract, serotonin (5-hydroxytryptamine, 5HT) acts both as a neurotransmitter and an endocrine/paracrine signalling molecule. In mammals, the bulk of 5HT is contained in, and released from, the GI tract. 5HT is mainly synthesised, stored and secreted from enterochromaffin (EC) cells, which constitute a subtype of endocrine cells in the GI mucosa (Gershon 2013; Mawe and Hoffman 2013). In addition to 5HT generated in the EC cells, 5HT is also generated by enteric neurons and mast cells in the GI tract (Ahlman et al. 1981; Kushnir-Sukhov et al. 2007; Gershon 2013). Tryptophan hydroxylase (TPH) is the rate-limiting enzyme in 5HT synthesis. Two types of this enzyme exists, TPH1 used by EC cells and TPH2 used by neurons (Côté et al. 2003; Walther 2003; Sakowski et al. 2006). 5HT from EC cells can either be released into the lumen from the apical part or to the circulation and local environment from the basal part (Bertrand and Bertrand 2010; Martin et al. 2017). Extracellular 5HT is inactivated and recycled by reuptake into nearby cells through a selective serotonin transporter (SERT) (Mawe and Hoffman 2013). Both EC cells and tuft cells are suggested key chemosensory cells in the GI tract. 5HT mediates several functions in the GI tract, including enteric reflex activities, inflammation and development (Gershon 2013; Bellono et al. 2017; Spohn and Mawe 2017) and tuft cells are involved in luminal sensing and inflammation (Gerbe et al. 2012; Howitt et al. 2016; Kaji and Kaunitz 2017). Therefore, the aim of the present study is to investigate the relationship between tuft and EC cells using immunocytochemistry. Six mice (C56BL/6J background, male, weight 20–25 g) were purchased from Janvier Labs, France. Before sacrifice, they were housed in groups of three in individually ventilated cages and kept on a 12-h light/12-h dark cycle, with standard chow (R36, Lactamin, SE) and water freely available. Procedures were approved by the regional Malmö/Lund committee for experimental animal ethics, Swedish Board of Agriculture (M95-15). Animals were used in accordance with the European Community Council Directive (2010/63/EU) and the Swedish Animal Welfare Act (SFS1988:534). Animals were deeply anaesthetised with an intraperitoneal injection (0.4 ml/20 g) of Rompun (0.4 mg/ml Bayer, German) and Ketalar (6 mg/ml Pfizer, USA). Intestines were exposed via an incision along the abdominal midline. Intestinal tissues were collected before animals were sacrificed by heart puncture. The small intestine was collected from 2 cm distally from the pyloric sphincter to the cecum and divided equally into five segments (labelled SI 1-5, 5-6 cm each). The five segments and the undivided large intestinal segment (labelled LI) were opened along the mesenteric border and rinsed in Hank’s balanced salt solution (HBSS, Gibco, BRL, Life Technologies AB, Stockholm, Sweden). They were then coiled into a “Swiss roll” as previous described (Moolenbeek and Ruitenberg 1981; Bialkowska et al. 2016; Cheng et al. 2018), immersion fixed in Stefanini’s fixative (0.2% picric acid, 2% formaldehyde in 0.1 M phosphate buffer, pH 7.2) overnight and rinsed three times in Tyrode’s solution containing 10% sucrose at 4 °C. The Swiss rolls were then embedded in FSC22® Clear (Leica Biosystems, SE), and frozen at − 80 °C until processed for immunocytochemistry. Cryo-sections, 10 μm, were cut, mounted on microscopic slides and washed in PBS-T for 10 min. Sections were processed for double immunostaining using antibodies against the pan-tuft cell marker doublecortin-like kinase 1 (DCLK1) raised in rabbit (1:250, code ab37994, Abcam, Gerbe et al. 2009; Cheng et al. 2018)) combined with antibodies raised in goat against 5HT (1:1000, code 66047, Abcam, Brooks et al. 2017), or SERT (1:100, code 130130, Abcam, Latorre et al. 2016), or in sheep against tryptophan hydroxylase (TPH; 1:800, code 32821, Abcam). In addition, antibodies against 5HT raised in rabbit (1:640, code ser1-16, produced and donated by Professor Steinbush, Steinbusch et al. 1978) in combination with TPH antibodies were used. Slides were washed 3 × 10 min in PBS-T before incubation with secondary antibodies raised in donkey against rabbit IgG (Alexa Fluor594 conjugated, 711-585-152, 1:1500 Jackson Immuno Research, SE), goat IgG (Alexa Fluor488 conjugated, 705-545-147, 1:1200 Jackson Immuno Research, SE), or sheep IgG (Alexa Fluor488 conjugated, A11015, 1:800 Invitrogen) for 1 h at room temperature. After washing in PBS-T 3 × 10 min, sections were mounted in phosphate buffer:glycerol 1:1. Antisera against 5HT were absorbed with excess of 5HT (10-100 μg/ml antiserum in working dilution) and used as controls. Synthetic immunogens to the DCLK1, SERT and TPH antisera are not commercially available therefore omission of primary antibodies was used as controls. Slides were scanned in fluorescent mode on a digital slide scanner, Nanozoomer 2HT, equipped with appropriate filters and NDP2-viewer software (Hamamatsu, JP). Confocal microscope Nikon Eclipse Ti (Nikon, Japan) and NIS elements software (Nikon, Japan) were also used. Tuft cells containing DCLK1-IR, with or without 5HT-IR material, were identified and counted in S1-S5 and LI segments and expressed as relative numbers. The numbers of DCLK1-IR tuft cells, 5HT-IR tuft cells (DCLK1/5HT-IR) and 5HT-IR EC cells were estimated per villus and per crypt. The percentages of tuft cells (DCLK1-IR) in contact with 5HT-IR EC cells and the percentages of 5HT-IR EC cells in contact with tuft cells (DCLK1-IR) were estimated by cell counting in each segment. Contacts were estimated based on close anatomic proximity. At least 120 villi and crypts were included per small intestinal segment; in the large intestine, crypts were evaluated. Data are presented as means ± SEM and analysed by GraphPad Prism (GraphPad software Inc., USA). Significant differences of cell numbers were determined using one-way ANOVA, with Turkey’s multiple comparison test. P < 0.05 were considered significant. All small intestinal segments, SI 1–5 (proximal jejunum to distal ileum) and the undivided large intestine (LI) were examined. DCLK1-IR cells displayed the characteristic fusiform tuft cell morphology with a marked brush border, while 5HT-IR EC cells showed a triangular flask-shaped morphology. Using double immunolabelling, we, unexpectedly, identified a subset of tuft cells containing intense 5HT-IR in their apical regions (Fig. 1a). Confocal microscopy confirmed the accumulation of 5HT-IR material in the tuft cell apex (Fig. 1b–d) and also revealed numerous 5HT-IR vesicle-like dots juxtaposed to the apical tubular network in some of these cells (Fig. 1b). In EC cells, the 5HT-IR material accumulated basally but apical accumulation was also noted (Fig. 1a). 5HT-IR tuft cells (DCLK1/5HT) were frequently found in all segments of the small intestine, both in villi and crypts but they were rare in the large intestine (Fig. 2). Thus, further studies focused on the small intestine. DCLK1/5HT-IR cells were estimated by counting and their numbers and relative numbers to all DCLK-IR cells, per villus and per crypt in the different small intestinal segments are presented in Fig. 2. DCLK1-IR (with or without 5HT) and 5HT-IR EC cells all showed a gradual decrease in numbers distally in the small intestine (Fig. 2). A large proportion of tuft cells was identified as DCLK1/5HT-IR cells. Up to 80% of all tuft cells residing in villi contained 5HT in SI 1 (Fig. 2a). Their relative numbers decreased distally, to 46% in SI 4 and 35% in SI 5 (Fig. 2a). In crypts, the relative numbers of 5HT-containing tuft cells were lower than in villi, with 20–30% in SI 1–4 and 12% in SI 5 (Fig. 2a). In villi, a proximo-distal gradient of the total population of DCLK1-IR cells, as well as of the subpopulation containing 5HT, DCLK1/5HT-IR cells, was noted (Fig. 2b). In SI 1, the number of DCLK1/5HT-IR cells was 1 ± 0.1 per villus; they then gradually decreased to 0.2 ± 0.05 in SI 4 (P < 0.0001 compared to SI 1 and < 0.01 compared to SI 2) and 0.2 ± 0.04 in SI 5 (P < 0.0001 compared to SI 1 and 2, P < 0.05 compared with SI 3). In crypts, the numbers of DCLK1-IR as well as of DCLK1/5HT-IR cells showed no significant differences between segments. DCLK1/5HT-IR cells ranged from 0.1 ± 0.02, in SI 1 down to 0.06 ± 0.02, in SI 5 (Fig. 2c). To evaluate possible anatomic proximity between tuft and EC cells, the percentages of all DCLK1-IR tuft cells in contact with EC cells, as well as the percentages of all EC cells in contact with DCLK-IR tuft cells were analysed in SI 1–5. Of all DCLK1-IR tuft cells, 2.7–4.2% in villi and 6.4–12.2% in crypts were in close contact with 5HT-IR EC cells (Fig. 3). Of the EC cells, 2.3–4.1% in villi and 5.3–9.6% in crypt were in close contact with DCLK1-IR cells (Fig. 3). Is 5HT synthesised by DCLK1/5HT-IR tuft cells? Double immunostaining with antibodies against TPH and DCLK1 or 5HT was used to evaluate if tuft cells have the potential to synthetize 5HT. Throughout the small intestinal segments, TPH-IR was observed in scattered triangular epithelial cells and in nerve fibres, submucous as well as myenteric (Fig. 4a). No co-localization of DCLK1- and TPH-IR material was found (Fig. 4b–d). Double immunostaining using antibodies against TPH and 5HT showed all TPH-IR epithelial cells to be 5HT-IR EC cells (Fig. 4b–d). 5HT-IR EC cells without TPH were occasionally noted. It was further tested if DCLK1-IR cells express the serotonin transporter SERT, thus enabling 5HT uptake from lumen. Double immunostaining using antibodies against DCLK1 and SERT showed SERT-IR with variable intensity in several connective tissue cells in lamina propria, in blood cells and in most epithelial cells. Co-localization of SERT and DCLK1-IR was, due to the general and irregular epithelial expression of SERT, hard to establish or reject with certainty (Fig. 4e, f). In this study, we describe the regional distribution of a novel subpopulation of tuft cells that contains 5HT-IR apically. The source of this 5HT could not be revealed. We also describe the distribution and contacts of DCLK1-IR tuft cells and 5HT-IR EC cells. DCLK1/5HT-IR tuft cells account for a large proportion of tuft cells and show a regional specific distribution along the small intestine. The highest density of DCLK1/5HT-IR cells was found in the jejunum, coinciding with both the highest number of tuft cells and of 5HT-IR EC cells. Tuft and EC cells are both suggested to be stimulated by nutrients and luminal compounds, e.g., fatty acids, glucose, acids and bases (Grundy 2008; Bertrand and Bertrand 2010; Reigstad et al. 2015; Kaji and Kaunitz 2017), which are present in higher concentrations in the upper than in the lower small intestine. The here reported gradient of tuft cells, including those containing 5HT and EC cells likely reflect this gradient. Tuft cells have previously been reported to be in close proximity with satiety-associated endocrine cells containing cholecystokinin, peptide YY or glucagon-like peptide 1 as well as with enteric nerve fibres, particularly CGRP-IR nerve fibres (Cheng et al. 2018). The finding that a large subpopulation of small intestinal tuft cells contains 5HT apically provides new clues to understand their putative roles in regulating GI activities. The cellular distribution of 5HT, described here in tuft cells in the mouse small intestine, closely resembles that reported for phosphorylated girdin (Kuga et al. 2017). If tuft cells with apically located 5HT are identical to tuft cells, apically containing girdin remains to be established. In contrast to the present study, Kuga et al. 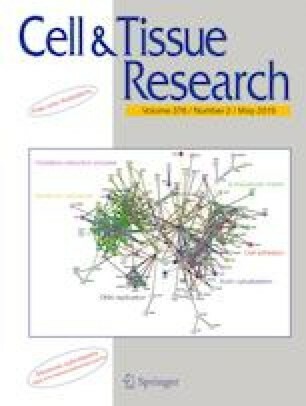 (2017) did not report any regional specific distribution of girdin-IR tuft cells and it is not clear if tuft cells with apical girdin constitute a subpopulation or if it is a general feature of tuft cells. However, coexistence of 5HT and phosphorylated girdin in a large population of tuft cells in the mouse small intestine has to be the case. Girdin is found to mediate assembly of signalling pathways both to receptor tyrosine kinase and G protein-coupled receptors (Garcia-Marcos et al. 2015). This substantially corroborates the view that tuft cells are central regulators of diverse GI activities including metabolic signalling and intestinal growth/maintenance and that 5HT may be a key regulator. EC cells are identified as the major source of 5HT in the gut but other intestinal 5HT generators, such as enteric neurons and mast cells are recognised (Kushnir-Sukhov et al. 2007; Gershon 2013). The synthesis of 5HT relies on TPH, the rate-limiting enzyme, which exists in two forms, TPH1 expressed in EC cells and TPH2 expressed in neurons (Walther 2003; Sakowski et al. 2006). Recently, gut microbiota was also found to contribute to gut 5HT production by generating free 5HT and by increasing TPH1 expression in EC cells (Hata et al. 2017). The finding that tuft cells contain 5HT-IR material urged us to investigate if they are to be added on the list of putative generators of gut 5HT. In the present study, we used a TPH antiserum that cross reacts with both isoforms but found no TPH-IR in tuft cells, suggesting that the 5HT present apically in numerous tuft cells is not synthesised by these cells. This is well in line with a recent single-cell gene expression study (Haber et al. 2017) showing lack of TPH expression in tuft cells. TPH-IR was, however, co-expressed with 5HT in EC cells and in enteric nerves, confirming the reliability of the antiserum used. If, as lack of TPH suggests, 5HT is not synthesised within the tuft cells we need to consider the possibility that a substantial reuptake of 5HT exists in the apical region. The 5HT transporter SERT, found in the intestinal epithelial lining (Mawe and Hoffman 2013), mediates reuptake of extracellular 5HT. However, the diffuse SERT staining with variable intensity found throughout the intestinal epithelia made it difficult to establish if SERT is present or not in tuft cells. In the single-cell expression data set published in the Haber et al. (2017) study, only 8 out of 166 tuft cells were found to express SERT. This indicates that SERT may be expressed in tuft cells, or at least in a minor subpopulation thereof. Still, we so far failed to identify the origin of 5HT in the tuft cell apex. Since tuft cells are suggested to communicate with neighbouring cells through cytospinules (Hoover et al. 2017), it may be suggested that 5HT is transported into the tuft cells by this route. This seems, however, unlikely since up to 80% of all tuft cells in villi contained 5HT but only around 3% of all villous tuft cells were found in close contact with 5HT-containing EC cells. Another explanation to the intense apical 5HT immunoreactivity in numerous tuft cells might be that they contain a high number of apically located 5HT receptors that bind luminal 5HT. In enterocytes from rabbit, no specific 5HT transporter could be identified, still 5HT binding was found in the brush border membrane (Alcalde et al. 2000). The 5HT uptake in these cells was not blocked by imipramine or found to be dependent on a Na+ gradient. However, by pharmacokinetic saturation and competition analysis, it was found to be mediated by 5HT4 receptors (Alcalde et al. 2000). If similar 5HT trafficking exists in the brush border of tuft cells remains to be examined. If, the here inferred, 5HT receptor binding leads to any physiological response in the tuft cell is an open question. Further, it can only be speculated on if such binding would lead to 5HT being inactivated or packed into vesicles. In the present study, we report on 5HT-IR vesicle-like formations interspersed between DCLK1-IR microtubules. DCLK1-IR microtubules are selectively expressed in tuft cells and are capable to mediate vesicle trafficking (Lipka et al. 2016). Notable is that 5HT is found in the intestinal lumen all along the intestine, from the duodenum to colon (Forsberg and Miller 1983; Bertrand and Bertrand 2010; Hata et al. 2017) but DCLK1/5HT cells were found only in the small intestine. Thus, if the tuft cell apex contains receptor bound 5HT, this would indicate the presence of different 5HT-receptor expression profiles between the small and large intestine. Release of 5HT from EC cells is triggered by, e.g., mechanical stretching of the gut wall and also by luminal nutrients and volatiles such as short chain fatty acids (Braun et al. 2007; Gershon 2013; Reigstad et al. 2015). The role of the chemosensory tuft cells is still enigmatic but may fit into this scenario by them acting as a sensor of luminal 5HT and a coordinator of gut 5HT homeostasis. A novel subpopulation of tuft cells, DCLK1/5HT-IR, is described. 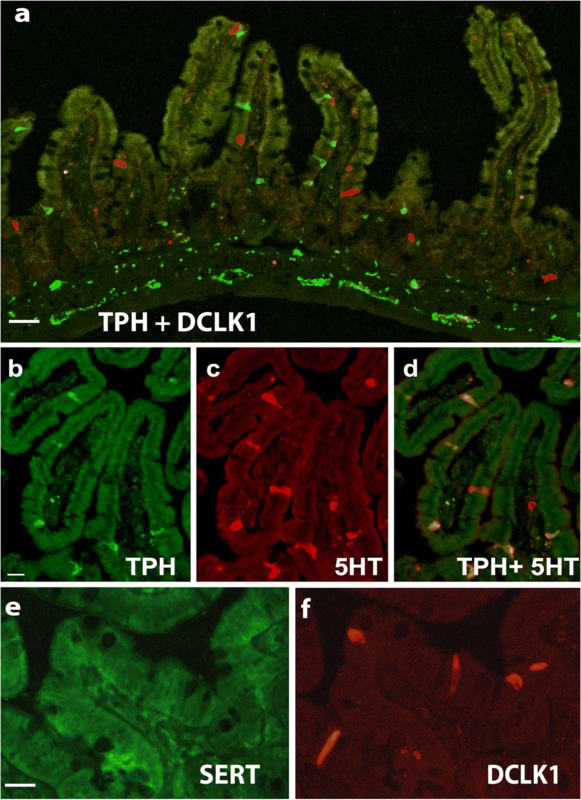 The DCLK1/5HT-IR tuft cells constitute a large population with a proximo-distal gradient in the mouse small intestine, while being few or absent in large intestine. Occasionally, tuft cells and EC cells are in close anatomic contact with each other. These findings advance our knowledge of tuft cells and indicate possible role(s) in the regulation of gut 5HT levels and GI control. The authors thank Anna Themner-Persson for the valuable technical assistance. This study was supported by the Påhlsson Foundation and the Faculty of Medicine, Lund University. X Cheng acknowledges a PhD scholarship from the China Scholarship Council. All applicable international, national and/or institutional guidelines for the care and use of animals were followed.